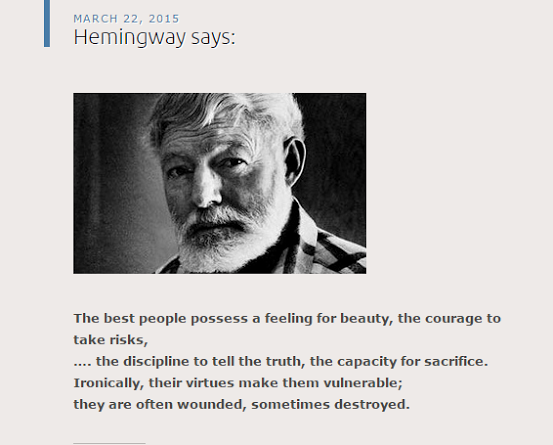 Hemingway; brilliant introspective writer. A man who lived with elaborate struggles in his lifetime. This statement leads me to a young lady, who at a tender vulnerable age found herself in the spotlight where many would be devoured to their death. I was watching TedTalks, a most revealing and poignant with depth of contrition and candor, Monica Lewinsky struck my core. As she spoke, I reflected upon that time in 1998, a very young 22 year old Monica Lewinsky would be judged and stoned by the world. Worse, she was betrayed by a female whom she thought to be a friend. I reflected upon my own life, the public eye I grew up in – due to a ranking Military Attaché Officer. How I learned to stay in the shadows while living in the spotlight, being tight lipped, never to divulge secrets until those confidences no longer mattered. The power of an overnight tsunami of gossip, lechery consumed the White House and Monica’s life. All reminiscence of an award winning film based on a true story – “The Stoning of Soraya M.” A horrific execution of a woman drenched in blood, mutilated. Shamed for being innocent, much like Monica. Most are unaware of the rigors in background investigations one must undergo to attain a position as a White house Intern. President Clinton, his life, his family came under the most egregious investigations into his personal life, by way of congressional vulgarity and the hiring of Ken Starr. Many did not care to know the personal interchange of our Presidents’ life. What the public cared about was: how the country was run and getting out of debt! Which President Clinton achieved and more, later, giving the world the Clinton Global Initiative. The written reports and tapes revealed by Ken Starr where nothing short of indecorous obscenities. We turned off our TVs, sicken by the contemptuous worldly display. Our country was a dog and pony show. Laughable for many who hold powerful positions. Powerful people and ordinary couples have rendezvous d’amour. It is easier to have an affair with a silver screen pop culture rock star, than a President. Standing in admiration, for a young girl falling in love with a charismatic authoritarian figure with such brilliance is uncommon in everyday life. Our public nature to cast the first stones of brutality, judgmental condemnation, millions of strangers attacking with shameful vehemence, shows the worse side of humanity! Monica had an affair! That is all. We judge, condemn, shame without ethical reprisal. The actions committed by online strangers have been far worse than the actual liaison. The malicious strangers have been far more egregious in their bullying and shaming tactics, uttering vile verbiage. We may have a constitutional right to free speech, nevertheless when that speech has opprobrious intention, with ostentatious garish attacks; were do we draw a line of human decency. Why do we allow others to have the right to speak such vulgarity? Self policing, is an endangered lost admiration, in our all so human world. Monica, as Soraya (The Stoning of Soraya) did not deserve such treatment. Stop the gossip. Stop the shaming. Stop throwing stones. We have more important matters to attend to regarding our lives and the planet we live on. Monica move forward with a momentous “Pivot” for her life and for others. She has attributed a horrid life experience, turning the tables onto the culpable perpetrators. Many who experience scandalous moments, view a truthful reflection, turn the mirrored tables, and grasp the opportunity to speak out for all sacrificial lambs. With poised emotions, Monica stood before her audience and spoke. The reality of shame from the public, their cruelty, their killing intentions from those who have never met Monica or who have never been in similar situations, spoke to the heart of her audience. Her innocent crime was to fall in love with a President. Monica has found a formidable platform, an ethical genre, showing how hateful strangers when not curtailing their words and actions, lead innocent people and their personal lives to extremes. They often die at the hands of the judgers. Who has committed a the crime here? “Power tends to corrupt and absolute power corrupts absolutely.” President Bill Clinton. Her campaign has a poignant message: become more educated, read more books, understand human nature with compassion. Do something worthwhile with your life – lend volunteer time to a worthy cause and less online defamation. There was a roar with a sudden standing Ovation when Monica finished her speech! How far are we willing to travel in leaving a legacy which shapes our lives and our careers? Monica’s career is being shaped out of defamation. Passion is a driving force, often times out of ashes, we rise.